Give a gift of flowers and show how much you care. Call Roxanne’s Flowers today! We’re a local full-service florist proudly serving Akron, PA and surrounding areas with an exceptional variety of fresh flowers, live plants, and unique giftware for all ages and occasions. Our courteous staff is ready to assist you with placing orders for local delivery or anywhere in the world. If you’re not sure what to send, please ask and we’ll gladly offer some creative ideas. 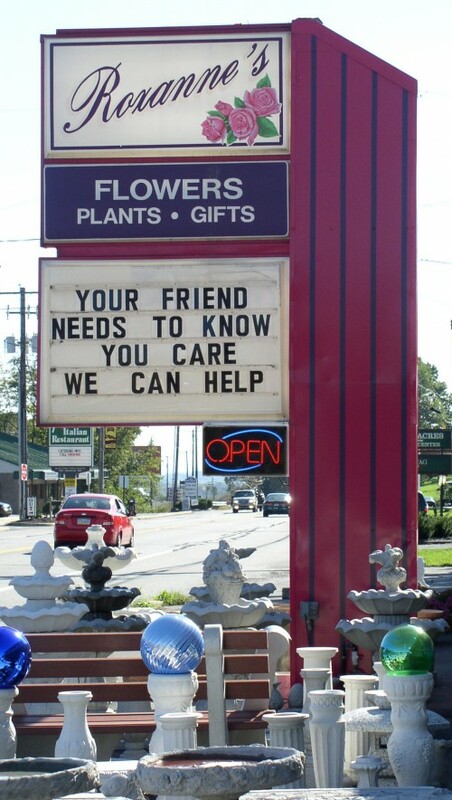 Roxanne’s Flowers is open to serve your floral and gift giving needs: Monday through Saturday 9:00 to 5:00. Let Roxanne’s Flowers help you create beautiful memories. Wedding Flowers & Special Event Flowers ~ Whether you prefer a look that is timeless and traditional or sleek and contemporary, we design floral arrangements to reflect the occasion, as well as your individual style & budget. Call (717) 859-1700 to schedule a consultation and let our expert floral designers help you plan an unforgettable event with gorgeous flowers! Sympathy Memorials & Funeral Flowers ~ Ask our staff about customizing a funeral floral arrangement to a departed friend or loved one. You can depend on us to help you choose flowers that beautifully convey your expressions of sympathy and serve as a lovely tribute to the deceased. Assorted Plants & All Occasion Gift Ideas ~ Liven up any room or office with an eye-catching dish garden or lush green & blooming plants. We carry an assortment of unique gift items, including baby gifts, plush animals, balloons, silk floral arrangements, home accents & décor, and much more! For your convenience, we offer daily delivery service to all local hospitals and funeral homes. Thank you for visiting our website with secure online ordering available anytime, day or night!